Sunway City Bhd (SunCity) will launch three office towers worth some RM800 million in Kuala Lumpur and within the Sunway Integrated Resort in Selangor. The group plans to subsequently inject them into its real estate investment trust (REIT). The property in Kuala Lumpur will be on Jalan Ampang next to the current Sunway Tower, formerly known as Wisma Denmark. This second tower, which will be 30 storeys high, will have 330,000 sq ft of nett lettable area with a value of RM230 million. 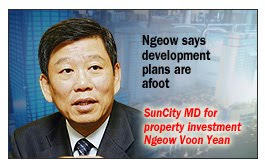 "Development plans are afoot and we will start physical work as soon as the plans are finalised," SunCity's managing director for property investment Ngeow Voon Yean said. It is also planning two office developments with nett lettable space of 277,000 sq ft and 500,000 sq ft, valued at RM245 million and RM330 million respectively. "These are in the advanced stage of design," he said. Once ready, the offices will be leased as they are slated to be part of the proposed REIT. Ngeow was speaking to reporters after the launch of Sunway Tower, a 27-storey building with 276,000 sq ft space. SunCity bought the property for RM170 million and spent RM26 million on upgrading. The building, also said to be part of the planned REIT, saw rental rates improve 30-40 per cent to RM5.50 a sq ft. It is fully occupied compared with 40 per cent previously. "With this inclusion, it has increased the commercial office net lettable area to about 600,000 sq ft and a total rental of about RM30 million a year to SunCity," Ngeow said. SUNWAY City Bhd (SunCity) hopes to list its real estate investment trust (REIT) in Malaysia this year, the group founder Tan Sri Dr Jeffrey Cheah said. "We are ready to go if the mar-ket is right for listing," he told Business Times at the launch of Sunway Tower in Kuala Lumpur yesterday. Cheah said that the right mar-ket would be one that gives a yield of about 6 per cent, which is a more manageable level compared with about 8 to 8.5 per cent currently. REIT yields rose last year as markets were hit, causing huge discounts to the net asset value (NAV). When asked if it was certain that the listing would take place on Bursa Malaysia, Cheah said: "Everything points towards a listing in Malaysia." "The timing (for a possible listing) this year looks more appropriate and we are working towards it," SunCity executive director Datuk Jeffrey Ng said. It was reported that SunCity was looking at a RM3 billion to RM4 billion REIT which will include Sunway Pyramid Mall, Sunway Resort Hotel, Sunway Pyramid Tower Hotel and Sunway Medical Centre in Selangor as well as Sunway Carnival Mall in Penang. The group first announced the REIT plan five years ago. 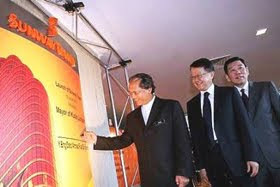 (From left): Kuala Lumpur mayor Datuk Ahmad Fuad Ismail signs his name while Tan Sri Jeffrey Cheah and Ngeow Voon Yean look on at the launch of Sunway City Bhd’s Sunway Tower. KUALA LUMPUR: Sunway City Bhd (SunCity) may inject Sunway Towers at Jalan Ampang and Sunway Hotel Seberang Jaya in Penang into its RM4bil real estate investment trust (REIT), said managing director for property investment Ngeow Voon Yean. Ngeow acknowledged that the group had been planning to float its property assets through a REIT for a number of years, but delayed it due to poor market conditions. He added that SunCity was hopeful of listing its REIT this year. “We’re seriously considering it (but) it all depends on timing. Once the window is open for an IPO (initial public offering), we’ll list. 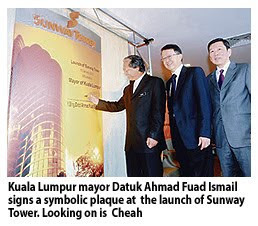 We hope to do it this year,” he told reporters after the launch of Sunway Tower yesterday. Previous reports said SunCity intends to inject Sunway Pyramid Mall, Sunway Resort Hotel, Sunway Pyramid Hotel, Menara Sunway, Sunway University College and Monash University campus in Bandar Sunway, Sunway Carnival Mall in Penang and Tambun Hypermarket Perak into its REIT. Sunway Tower comprises 27 levels of Grade-A office space with a net lettable area of 276,000 sq ft, eight levels of car park space and a freehold parcel of adjoining vacant land. Formerly Wisma Denmark, the building was acquired by SunCity in 2007 for RM170mil. Ngeow said the group had spent RM26mil on refurbishments, which resulted in a 30% to 40% increase in rental rates to RM5.50 per sq ft.
Ngeow said the building was almost fully occupied, and the group would be constructing another tower next to it. “The total net lettable area for both towers will be 600,000 sq ft. The new tower should be 27 to 30 storeys high and will cost RM300mil,” he said. The two will collectively be known as Sunway Towers. Ngeow also said SunCity planned for the Sunway Integrated Resort two office developments of 277,000 sq ft and 550,000 sq ft with a value of RM245mil and RM330mil respectively. The project, which would have a gross development value worth more than RM2.48bil, is a collaboration with Sino-Singapore Tianjin Eco-City Investment and Development Co Ltd (SSTEC). Meanwhile, Kuala Lumpur mayor Datuk Ahmad Fuad Ismail, who officiated the launch of Sunway Tower, said City Hall had yet to receive any application from Permodalan Nasional Bhd (PNB) or the Naza Group on their respective proposed 100-storey buildings. “We only heard about this through the media. We’ve not received anything from either party,” he said. In recent reports, PNB said it was looking at the possibility of developing a 100-storey skyscraper near the Stadium Merdeka/Stadium Negara area while the Naza group claimed it may develop a similar structure near the proposed Matrade Centre. Property markets in various parts of the world are coming alive again and property is regaining its lustre as one of the favourite investment instruments after more than a year of “hiccup” caused by the global financial crisis. Even while Dubai is still mired in a crisis after the collapse of its property market last November, most markets that have succumbed to the global financial crisis are bottoming out and are on a recovery mode. Despite the more positive outlook, industry players should not lose sight of the patches of “quick sands” that will easily negate any progress made if one is not careful. Among the possible pitfalls that will happen include a relapse in the global economy if it falters from its recovery path that will send property prices on another downward spiral like what has happened in London, Singapore and Hong Kong. Despite having shown a gradual recovery since the second half of 2009, the global economy continues to be filled with uncertainties this year. There is still the possibility of a double dip or another round of correction before we can claim the worst is over. Although Malaysia’s property market is also showing signs of recovery and there are more buyers looking for good property to buy, there are some outstanding issues that are still plaguing the market. Firstly, there is still a mismatch between demand and supply of both landed residences and high-end condominiums in some parts of the country. That explains why there are properties that have been completed in some townships that are still unsold and are languishing. Most of these projects are located in rather secluded places that are not easily accessible and were built without prior market diligence and feasibility studies to gauge their feasibility. Usually projects that are located in well planned or mature and vibrant neighbourhoods with ready facilities including schools, colleges, markets, shops and good road connectivity will have many ready buyers. Developers that are affected by poor take-up for their property should, wherever possible, make as much effort to “redeem” their projects by introducing more value added features and facilities to them. Hopefully, the extension of the light rail transit network to other parts of the Klang Valley will give a new lease of life to these projects. Another area with higher supply of properties than demand at this juncture is the Kuala Lumpur City Centre (KLCC) vicinity. This year alone, there will easily be another 1,200 new condominiums that will be completed. Last year, about 2,000 units came onstream and not all have been sold yet. Many of the units are still relatively large residences of more than 2,000 up to 7,600 sq ft whereas research has shown that there is a greater demand for smaller units of between 1,000 to 2,000 sq ft, especially among first time home buyers. Instead of catering just to the super high-end clients, it will be worthwhile for developers to re-size their units and build more smaller units to make them more affordable for the buyers. At average prices of RM900 to RM1,100 per sq ft, most of these smaller units will already have price tags of close to RM1mil or more. Another challenge that will be faced by the market is the possibility of rising entry cost for buyers once developers decide to end their housing financing facilities. Although a growing number of Malaysians have become savvy property buyers and own multiple properties, many are still dependent on the low entry cost offered by the developers and the banks in the past one year to make their first purchase. Efforts to promote stronger buying interest among local buyers should be continued as they form the bulk of property purchases. Malaysians are also known for having a longer term outlook and will not just liquidate their positions in a hurry like some of the foreign buyers. Should the housing packages be ended, developers can help ease the burden of buyers by absorbing the cost of transactions including stamp duties and legal fees, among others, for houses priced below RM500,000. Deputy news editor Angie Ng sees the need for closer consultation and collaboration between the various stakeholders of the property fraternity to offer their views on project planning and designs that will promote greater unity and kinship among Malaysians. 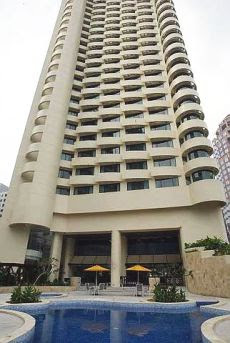 The Novotel Hydro Majestic Hotel was sold for RM156mil last year. The outlook for the local hotel industry is expected to be positive this year after the hospitality industry showed some pick-up in the second half of last year, says Malaysian Association of Hotels (MAH) senior vice-president Ivo R Nekvapil. “Barring any bad press with less emphasis on H1N1, the industry can do much better,” he tells StarBizWeek through an-email reply. He says Malaysia is a great value-for-money destination and that it just needs more international brands toboost the country’spopularity. “We need more innovative domestic packages and a push for more homestays. We also need plans to open more areas for tourists, like islands and eco resorts as in Sarawak,” he adds. Malaysia should also cut the red tape where possible and create a “one-stop shop” for tourism like what the International Trade and Industry Ministry (Miti) and the Malaysian Industrial Development Authority (Mida) are doing for manufacturing, according to Nekvapil. Tourism is Malaysia’s second highest revenue earner. “We also need to strongly push the Malaysia My Second Home programme as there is huge potential there,” he says. On recent news report that Tourism Minister Datuk Seri Dr Ng Yen Yen has urged hoteliers to review hotel room rates, Nekvapil says 5-star hotel rates must increase as the rates in Malaysia are still the lowest. “(Rates for five-star hotels) must go up comparable to other hotels in Asia. Then the 2, 3 & 4-star hotels can move up to a more realistic level,” he says. Integrated provider of serviced offices, hotels and serviced residences company, The Nomad Group Bhd, tells StarBizweek that they are positive about Kuala Lumpur’s serviced residences business. A spokesperson says the company believes there are plenty of opportunities to achieve high occupancy. “Although occupancy dropped slightly in November/December of 2009, enquiries for Nomad Residences Bangsar, for example, have since picked up this month,” he says in an email. He adds that the hotel group’s residents consist of various nationalities such as British, French and Australians. About 80% of its tenants comprise of international business executives. “We are not only getting leads from multinational companies but also generating interest from entrepreneurs who are in Kuala Lumpur to set up new businesses. The Nomad also provides them with serviced offices to work in,” he says. The spokesperson says location is very relevant and Bangsar is definitely still a favourite among both expatriates and Malaysians. “The variety of food and beverages outlets, shopping centres and specialty shops makeBangsar an attractive choice for many,” he notes. The Nomad Residences caters to those on short and long stays, making it easy for people who are in transition, relocating or who have been posted to Kuala Lumpur. “We have also seen improvement in our rates, as more people are demanding for the convenience of full fledge serviced apartments. Even leisure travellers looking to stay in one destination for more than 5 days are opting for the serviced residences type of accommodation,” he says. Zerin Properties chief executive officer Previndran Datuk Singhe says the company is expecting investments in hotel properties to pick up this year. “Interest will be mainly in Kuala Lumpur, Penang and Kota Kinabalu,” he says in an e-mail, noting that the Novotel Hydro Majestic Hotel was sold for RM156mil to a local buyer last year. 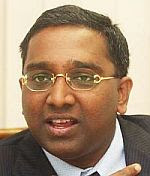 “We saw a drop of investments in hospitality assets in 2008 due to lack of foreign buyers but by 2009, we saw the return of investors and the return of foreign sellers,” Previndran says, adding that factors which contribute to higher transactions include growth in the tourism business as well as higher low cost carrier traffic. “Tourists to Malaysia are still enjoying a much lower cost of spending in hotels. On average, they pay about RM560 for the hotel, compared with RM1,867 in Singapore and RM895 in Bangkok,” he says. It was reported recently that Malaysia recorded tourist arrivals of 23.5 million in 2009, more than its initial target of 19 million despite a global decline in the industry due to the economic downturn and other challenges. Previndran, citing a report by Travel & Tourism 2009, says Malaysia has emerged as the fourth most price competitive country in the world out of 133 countries surveyed. On new trends in hotels and resorts in Malaysia, Previndran notes a rising trend in spa resorts, branded budget accommodation, health tourism and nature tourism. PETALING JAYA: AmanahRaya Real Estate Investment Trust’s (REIT) management company, AmanahRaya-REIT Managers Sdn Bhd, has proposed to buy two leasehold buildings for RM227mil. In an announcement to Bursa Malaysia on behalf of the management company, ECM Libra Investment Bank Bhd said the acquisitions and related expenses would be part-funded via a proposed placement to raise RM119mil. “The actual number of placement units to be issued pursuant to the proposed placement will be determined based on the final issue price of the placement units, which shall be determined later,” the investment bank said adding that AmanahRaya-REIT Managers proposed to acquire the six-storey Selayang Mall and the 13-storey Dana 13, a stratified office building that is part of the Dana 1 Commercial Centre in Petaling Jaya. VALE S.A., the world's biggest iron ore miner, will soon conclude a deal to buy 16.5ha of land in Manjung, Perak for RM101.9 million from property developer KYM Holdings Bhd, people involved in the talks said yesterday. The deal was first announced in June 2009, with a year-end wrap-up target initially. However, that has been extended to January 18. Brazil's Vale plans to invest about US$5 billion (RM16.7 billion) in Perak over five years for the iron ore distribution and pelletising plant project. KYM's controlling stakeholder Datuk Lim Kheng Yew, a merchant banker turned businessman, told Business Times that the company is close to wrapping up the deal, but declined to speculate on the time line. After months of lull, the project appears to have gathered pace. In December, it signed a conditional deal for transhipment services of iron ore cargo with Integrax Bhd. Integrax's Lekir Bulk Terminal Sdn Bhd (LBTSB) owns the Lekir Bulk Terminal (LBT) in Manjung. As part of the deal, LBTSB will pump in as much as RM200 million to expand LBT and make it a transhipment hub. But it is understood that KYM is also keen to be part of the US$5 billion project, banking on its close relationship with Vale. Lim noted the entire land sale to Vale would strengthen KYM's balance sheet, and help reduce interest costs. As it stands, Vale also has an option to buy another 305.95ha of land in Manjung from KYM for RM93.8 million cash. Vale will be buying the land from Harta Makmur Sdn Bhd, a 54 per cent unit of KYM. KYM controls Harta Makmur via its 90 per cent shareholding in Tegas Consolidated Sdn Bhd. Proceeds from the sale will boost KYM's shareholders' funds to RM72.3 million from RM23.85 million as at end October 2009. Its debt to equity ratio, a measure of debt, will fall to 0.41 times from about 8.9 times, with net asset per share rising to 89 sen from 29 sen before the sale. The proposed sale of the entire property will help KYM cut debts of RM209.71 million as at January 31 2009.